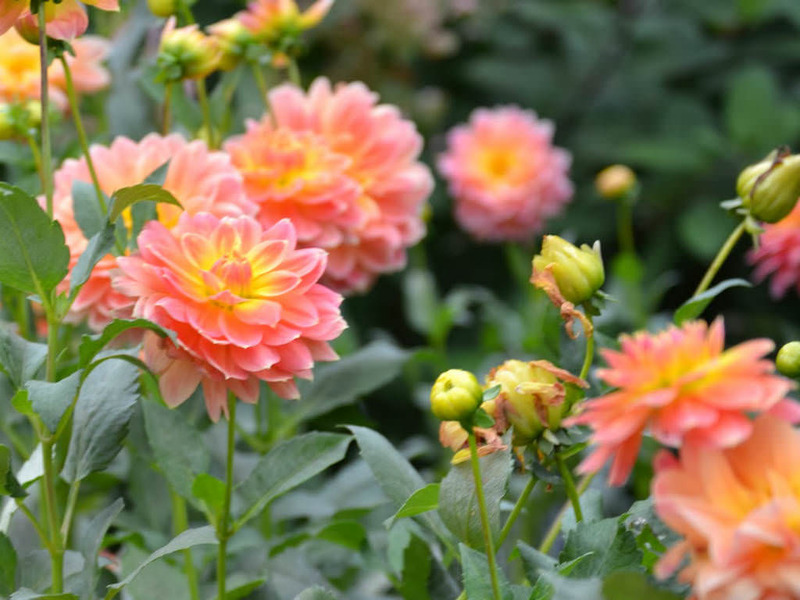 Revered for its beauty, the stunning Dahlia flower comes in diverse shapes, sizes and colors. The Dahlia blooms for extended periods of time, surpassing most other garden flowers, and many gardening enthusiasts refer to it as the “Queen of the Autumn Garden”. The Dahlia‘s allure has a far reach: it is San Francisco’s official flower, an official emblem of Mexico, and is considered in Japan to be a sign of good taste. Indigenous to the highlands of Mexico and Guatemala, the Dahlia flower first arrived in Europe in the 1500s, following the defeat of the Aztec Indians by Spanish conquistadors. Dahlias were introduced to Spain by returning botanists, who had accompanied the Spaniards to the New World. In 1789, Vincente Cervantes, director of Mexico City’s Botanical Gardens, sent Dahlia seeds to Spanish botanist Antonio Cavanilles of Madrid. Eventually, Cavanilles sent Dahlia bulbs to Swedish botanist Andreas Dahl, for whom the Dahlia is named. Dahl helped popularize the flower throughout Western Europe and Scandinavia. Before the Spanish arrived in Mexico, the Aztecs named the Dahlia “Acocotli,” which means “water cane.” This specifically referred to the Dahlia imperialis, which today is called tree Dahlia. Growing to a height of 20 feet or more, this variety of Dahlia has hollow stems, which Aztec hunters used to transport water. Centuries ago, the Dahlia‘s large, fleshy roots, or tubers, held significant meaning for the Aztecs, who used the underground part of the plant to create a treatment for epilepsy. Dahlia, which means “valley,” is a reference to Andreas Dahl, though it unclear as to why the flower received his surname instead of being named after one of the first Spanish botanists to study it. Dahlia flowers belong to the Asteraceae family, a group that includes Sunflowers, Asters and Daisies. “Asteraceae” means “star,” referring to the star shape of the Dahlia blossom. Symbolizing hope for an everlasting union between two people, Dahlia flowers are presented to couples at engagement parties and weddings. These flowers, which bloom in white and a variety of showy hues, including pink, crimson, orange and yellow, are given as an anniversary gift in celebration of 14 years of marriage, although the origin of this tradition is unknown. In Victorian times it was inappropriate to exhibit intimate feelings in public, and the exchange of flowers expressed unspoken words of affection. Dahlias, like many of varieties of flower, were imbued with different meanings. Dahlia blossoms represent contradictory virtues. The flower’s negative connotations of betrayal, instability and dishonesty conflict greatly with Victorian-era ones of dignity, elegance and forever thine, which are still relevant meanings of today. Because of its disparate meanings, a written explanation included with the bouquet of Dahlia flowers might help to clarify a sender’s intentions to the recipient.